We’ve been reading up on the Newtown Connections project. Feedback is open until 11 December; please take a moment to have your say today. There’s heaps of information online, from technical and background info to good ideas in comments from people who have already made a submission. Here’s what we think. Comfortable – for all ages and abilities. We don’t have a preferred option out of the three packages proposed. BUT with a little change, we support a combination of Package C routes (best balance of ‘connection’ and ‘convenience’) with Package A ‘2x 1-way’ paths (best for ‘comfort’ and safety) where possible. Rintoul Street’s a must-do route, as the least steep route south of Newtown. It serves SWIS directly. There’s less parking impact as it runs beside Village at the Park, and Wakefield Hospital. And it provides the best connection to Newtown shops. The steep section on Adelaide Road north of Luxford Street, and the steepness of the western off-road option through MacAlister Park, rule them both out as ‘all ages and abilities’ routes. Our preference more or less matches ‘Package C+’ identified by Regan for Island Bay Healthy Streets (love the new name! 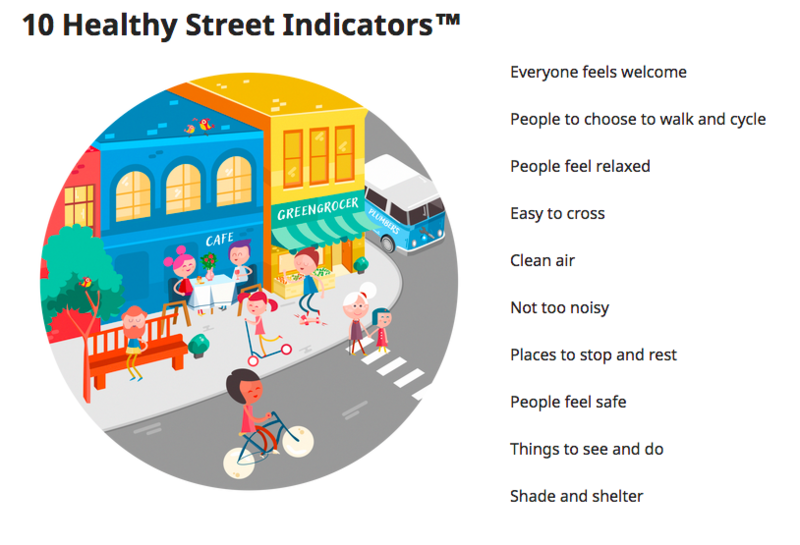 ), and we think of it as the Healthy Streets Option as it best fits the objectives of that approach. We want to stress that at this stage in the design process, our preference for a specific package is less strong than our desire to see a good outcome overall. We recognise that the viability of some combinations of route and path type depends on more detailed design to be done later. We also have some ideas for making the most of the detailed design stage, and an overall plea: be bold! Wellington will see the greatest health, economic and efficiency benefits if the network both keeps people safe and also makes them feel safe. You can do this best with protected lanes. Avoid ‘on road’ cycle lanes or areas where people on bikes mix with traffic on busy main roads — this type of treatment becomes the weak link in the chain that puts more vulnerable people off giving cycling a try. Even a few metres of danger (such as through an intersection, or through a shopping area) are enough to undermine the benefit of good bike paths either side. Despite best intentions, 30km shared zones don’t work well on main arterial roads with lots of trucks and buses, such as through Berhampore shops or Newtown shops. Good protected lanes don’t depend on good driving behaviour as much as shared zones or paint-only bike lanes. Businesses need to load goods, and in practice delivery drivers will often stop wherever is easiest. To work with this, protect bike lanes from parking and provide loading zones that are more convenient to use. Protected intersections can help maintain comfort for cyclists and other road users. Tight spots can make physically protected bike lanes difficult to fit in. At these pinch points, and at junctions, separate cyclists from conflict with other traffic using time instead of space, with dedicated stages in the traffic light sequence. Off-road routes are great, but must be in addition to (not instead of) paths that follow the most direct routes. Off-road routes are typically not the most direct, flattest, or most connected to destinations. Providing a variety of routes is important because connectivity is important! The more connections the network provides, the better the uptake will be. If you can pave and light the off-road routes, so they become viable options all year round, at any time of day, do it! Motion sensors could allow the lighting to respond to the presence of people, saving energy when the paths aren’t in use and adding a ‘wow’ factor when they are. We absolutely understand the desire to use two-way cycle lanes to mitigate effects on parking, but we can’t endorse this approach if it results in greater risk for people riding bikes. Two-way cycleways don’t work well on roads with lots of intersections or driveways — the risk of being sideswiped by a driver who didn’t look both ways before crossing the cycleway is high. Two-way cycleways are also risky on steep hills, because of the speed differential between uphill and downhill cyclists. Taking both of these things into consideration, we don’t think two-way cycleways are appropriate for many of the places you’ve proposed them, such as on Rintoul Street and Adelaide Road in Package C.
That said, a two-way cycleway may be appropriate for Riddiford Street, in the low-speed shopping area, as long as intersections and transitions are handled very carefully. Drivers are already used to slowing and looking both ways for pedestrians when turning into most of the side roads through Newtown, which lowers the risk for people on bikes. Lowering the speed limit to 30km/h through there would also help. Whichever route or mix of routes you choose, include a less steep route to attract the most people. Not everyone wants to climb the Adelaide Road hill. Prioritise resident parking over commuter parking — consider introducing residents-only zones, with no fee for the first while to help residents see the value before they have to start paying? Create more parking spaces on council land — for example, at the top of MacAlister Park? Make the hospital own its parking problem, which currently has a major impact across Newtown and beyond. Unlike most workplaces, there really is a case for the hospital taking responsibility for providing parking for staff and visitors. Hospital support for carpooling, public transport and other behaviour change (for the staff who can) could reduce demand too. Direct bike lanes are part of the solution too. Innovations like Onzo bike-share and electric scooters show how rapidly transport can change. Build paths that work for a variety of users, with specifications that make them resilient to change — whether that’s the next new transport idea, or an increase in mobility scooters, or simply a large uptake in biking. For example, you could provide bike parking along the route that would be convenient for finding or leaving a dockless share bike without blocking the footpath. Pay particular attention to intersections, and to the transitions between protected lanes and other types of treatments. For example, use things like hook turns and dedicated traffic signals to avoid vulnerable people having to mix with buses, filter through lanes of traffic, or wait to turn on green spots in between lanes of moving traffic. Removing parking is really hard, and we have sympathy for businesses and residents who will have parking removed near their properties. But Wellington cannot become a truly resilient 21st century city without making it possible for more people to cycle and leave the car at home. Our population will continue to grow, and we have finite space — we can’t endlessly accommodate more and more cars. Go and have your say — it matters! As well as Thorndon Quay, WCC is consulting on two other cycling projects: a short stretch of cycleway on Oriental Bay between Herd St and the Freyberg Pool, and a two way cycleway on Evans Bay Parade south of Cobham Drive. Please take a few minutes to read about these, and make some comments by 19 March. Have a look at our suggestions for individual submissions. If possible, draw on your own experience of using these routes. 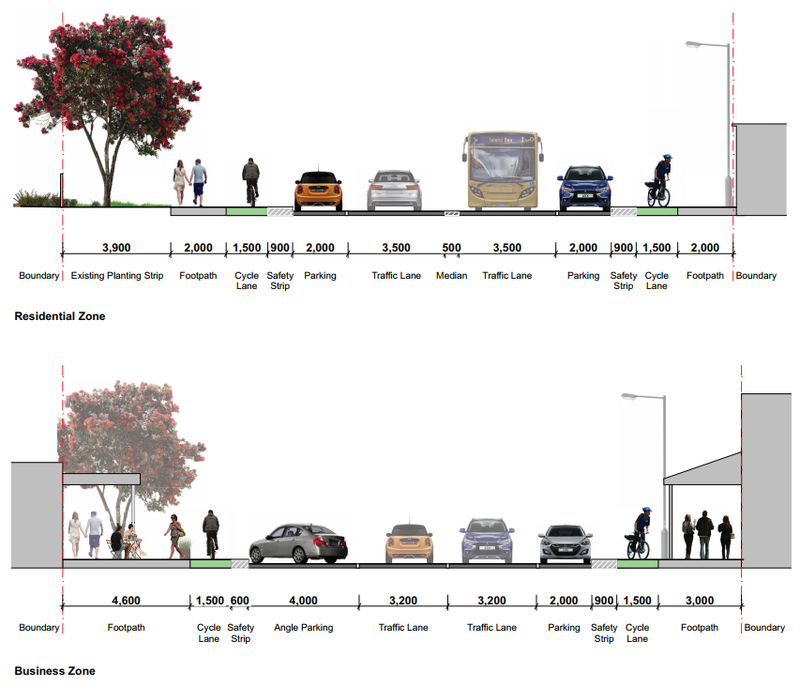 Oriental Parade: The two way path in the proposal is… a bit narrow at 2.5m for such a busy route (Christchurch’s Cycle Design Guidelines recommend 3.5m, with a minimum of 3m) . And for what, to keep both angle parking and a median strip? Which doesn’t seem all that bold. The parking in question mostly has a TEN HOUR limit (yup). On the city’s premier waterfront boulevard. Why not just set better time limits and pricing, so it’s available for some better purpose than commuter parking. And the median? It makes it easier to get cars into and out of garages. BUT the proposed bike path is separated from the walking path at last. It just seems a pity to have a solution that is compromised by the needs of cars rather than people. Evans Bay Parade (south of Cobham Drive) has a proposed path which is pretty good. Serves the school well, links to the waterfront path. As with the Oriental Bay bike path, it’s a bit narrow for a two way path. Needs better visual separation, and maybe a centreline. Needs a better crossing on Cobham Drive though – get rid of a slip lane maybe? The stuff around the new bus hub looks like a nice way to deal with a tricky road layout. Lots to like there. Turning from Coutts into Te Whiti looks dangerous. Provide for safe two-stage (hook) turns. Avoid the need to merge with traffic next to parked vehicles. The roundabout on Tirangi Road is a big gap in 2 paths that will affect both routes. Consider a Dutch-style protected intersection, or at least use raised tables and crossings – to slow traffic and give a safe way to cross that follows pedestrians’ desire lines. The transitions at the start and end could be better – dooring risk if riders leave the road for the path opposite Carlton Gore Rd, and a bit of a do-or-die moment opposite NIWA if someone’s driving behind you. …and lastly, at Kio Bay the road widens just before retained car parks – a pinch point hazard for roadies (and for drivers!). Extend the wider buffer around to those parks to avoid a sudden pinch point. We hope Phase 2 (on round to Cobham Drive) follows quickly, because Greta Point is not nice to ride through at the moment. Crawford & Constable looks great in a pragmatic way. Tweaks: Add a raised table across Alexandra Rd entrance, & extend protection past the previous driveway to stop people cutting the corner & slow turning traffic. Paint the bike lane all green so it’s obvious! Planned ‘Quiet Streets’ like Te Whiti and Yule need measures to slow or reduce traffic (eg no-through-road bollards). Use raised tables and sharper corners at side streets to slow turning traffic. 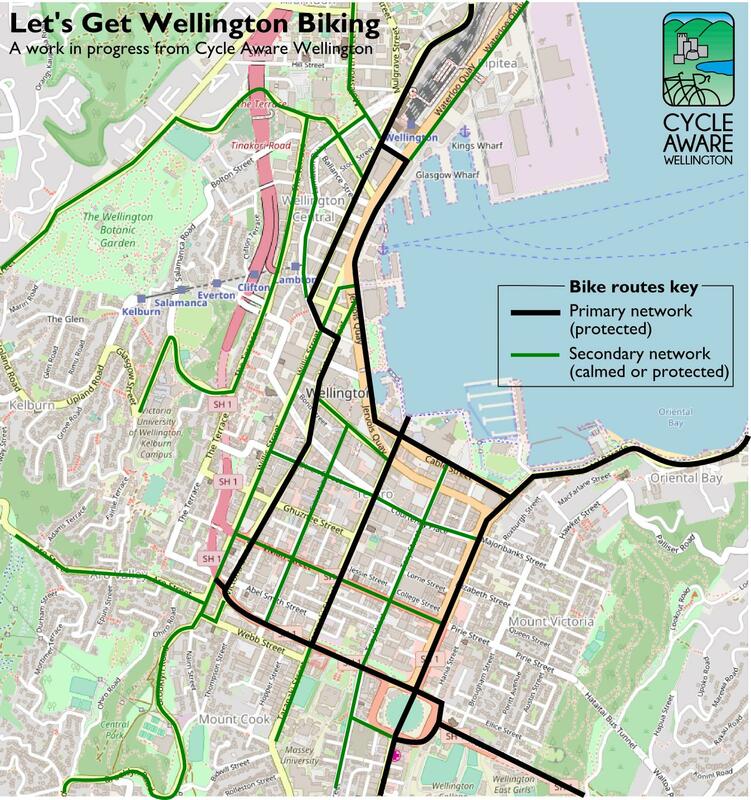 While Wellington’s Cycling Framework promises a network of protected cycleways through the city there are already a lot of cycle friendly routes that we can use to navigate the CBD. These are the laneways – small connecting streets between the busy arterial streets. Although they may not be as direct or as fast as the arterials, they can feel a lot more comfortable, particularly if you’re new to city cycling. This post reveals three of these “secret” routes – there are plenty of others to discover. Note that some of the routes are on private property, or are primarily for pedestrians. Be considerate, and be prepared to get off your bike and walk. While the laneways are quiet, the routes may involve crossing busier roads – take care! Vivian St to Karo Drive via Dunlop St and Wigan St. To the west of the VUW Architecture School, Dunlop St leads down to a parking area that exits onto Wigan St, handy to Lighthouse Cuba with its bicycle corral. Wigan St takes you to Abel Smith St. Turning left and then right takes you on to Kelvin Grove which has a ramp at the end leading on to the Karo Drive shared path by Third Eye Tuatara Brewery, leading east to Pukeahu park, or west (with a crossing to the south side at Cuba St lights) to the Aro Valley and Brooklyn. Ghuznee to Aro Valley via Buller and Palmer. Although Victoria St has bike lanes, some people find the multiple lanes of traffic daunting for heading south from the CBD. A quieter alternative is to head up Ghuznee to Buller St, just west of the motorway. This leads to Oak Park Ave which has a shared path heading towards the Karo Drive shared path at Willis St, or if you’re heading for the Aro Valley, a short detour through a car park at Inverlochy Place, crossing Abel Smith St to a narrow lane to Palmer St and the Aro Valley Community Centre (If you want to know what really goes on in this innocent seeming complex, check out Danyl McLauchlan’s Mysterious Mysteries of the Aro Valley!). Through the park, you can get on to Aro St at Garage Project Brewery. You can also access this route from the Karo Drive shared path. That’s just three possibilities. Next time you’re planning a route, have a close look at the map for laneways that might go where you want, or just keep your eyes open for interesting alleyways that might lead to where you want to go. WCC have 2 proposals open for submissions until Monday 16 October – extension of the separated path work for Hutt Rd, and a whole set of minor changes for the CBD. Please make a submission on anything you are interested in. The council would love to hear your individual opinions; here are some starter points to consider. The transition to the road opposite Tinakori Road needs to be safe for travel in both directions – bus conflict heading south and crossing difficulty heading North both need improving. Here (and for the whole Hutt Rd project) take care to separate biking and walking areas well. A height difference of planted / tactile boundary would help – different colours may not be enough. The on-road clearway/parking arrangement sounds a sensible way to give businesses parking off the path – but MUST leave enough clearance around business driveways for good visibility between drivers and people cycling on the path. These cover Featherston St (the block just south of the station), Post Office Square, and crossing Kent & Cambridge Tce near the Basin Reserve. Some context first – these minor improvements obviously don’t make a big difference to interested-but-concerned potential cyclists, or a connected network across the CBD. That has to wait for the frustratingly slow Lets Get Wellington Moving project – UNLESS someone runs a nice temporary trial…more thoughts on that soon. In the meantime, these minor changes should make a slight improvement for people who already bike around the CBD. Now to each proposal in turn. Basically, this replicates the current layout on the previous block, and shares its pros and cons. It’s preferable to what’s there the moment. However, we see this as an interim solution only. The narrower traffic lanes may help to slow traffic slightly. And the green cycle lane will help to endorse cyclists’ right to claim some space on the road. We’re pleased to see the painted buffer zone to protect cyclists from the ‘door zone’. WCC should add a ‘hook turn’ waiting box at the far corner of the Whitmore/Featherston intersection, clearly signposting it. This will allow a safer right turn from Featherston into Whitmore. This page has more detail: https://www.nzta.govt.nz/walking-cycling-and-public-transport/cycling/cycling-network-guidance/designing-a-cycle-facility/intersections-and-crossings/signalised-intersections/cycle-storage-facilities/. The proposal doesn’t yet provide any solution for the many cyclists needing to turn right into Whitmore Street. They still have to cross two lanes of fast moving traffic. Cars entering and leaving the parallel parks on the left of the road are still a hazard. The way the cycle lane leaves the left of the road to travel between two traffic lanes (at the approach to Whitmore Street) is a design that’s proven to be problematic, both further north on Featherston (at the approach to Bunny Street) and on Victoria Street (on the approach to Vivian Street). This is not a design that we want to see replicated around Wellington. It puts cyclists between two lanes of moving traffic, which can be more dangerous than ‘claiming’ the lane (where vehicles have to follow cyclists rather than pass). With moving traffic on both sides, a 1.6-meter lane seems narrow — there’s little room for error, especially considering the strong side winds that frequently gust around the streets adjacent to the waterfront. Car drivers frequently block this type of cycle lane while trying to change lanes. This style of cycle lane will be a mild improvement for the cyclists who currently brave the traffic in Wellington – and who deal with having no cycle lane on the next blocks of Featherston St. But it won’t encourage many new riders. As an interim solution, this looks like a good improvement on what exists at the moment. However, we expect to see much more comprehensive solutions for cycling around the Basin and on Kent and Cambridge Terraces as a result of Let’s Get Welly Moving. In particular, we want to see separation between cyclists and pedestrians, as forcing them to share the same space causes conflict. We support Living Street Aotearoa in saying that shared paths are not a good solution for busy central city routes. We recommend separated paths for cyclists and walkers, which should be do-able with the space available in this area. This gives you a way to get from Post Office Square to Queens Wharf and the waterfront – at the moment you have to ride on a few metres of the square’s pedestrian space. The proposal doesn’t seem to include clear marking – probably more important than the technical right/wrong difference here. The dropped kerbs will smooth out your ride across the Quays road, and probably will help keep people on bikes to an alignment that avoids getting in the way of people on foot. What will the revised Island Bay cycleway look like? You may have heard Wellington City Council this week approved a concept design for a revised cycleway along The Parade in Island Bay. The approved concept is based on the options presented for consultation. But it combines aspects of different options (as the council said it might), and also includes amendments introduced by the Mayor after discussions with Island Bay Residents Association. the amendments introduced by the Mayor, which match the announcement the council made. This is roughly similar to Option D from the consultation, but with wider traffic lanes. and a wider western footpath in the residential zone. cars will be parked against a kerb – easier for parking without encroaching into the cycleway. We’ll post again soon, looking at the features you can’t see in the cross-section and giving some of our thoughts and hopes for the detailed design. Cycling is an essential part of modern, successful cities. The government and councils are responding to strong public demand, and are investing in safe and attractive cycling all over New Zealand. The discussion has moved on from “why”, to “where and how”. The Stuff film reviewer is entitled to his opinion on how best to provide for cycling, but that’s no basis to make decisions that affect the whole community. In our democratic system we elect councillors to weigh up expert advice, council policy, best-practice guidance and community views before making decisions. For a decade Wellington people have been consistent in voting for mayors and councillors who are committed to improving cycling. It’s time to move forward. Who is the council designing cycleways for? It has always been clear that it’s not only to cater better to existing cyclists, but to make cycling an easy and attractive option for the many people who would like to ride. Cycling Action Network agrees that cities need to build streets for all ages and abilities. We call this AAA cycling. The evidence is clear that when cities build convenient, connected and comfortable cycleways, people love them. A network effect multiplies the benefits once routes are connected up. Since protected cycleways were built in Auckland three years ago there’s been a 62 per cent increase in cycle trips in the city centre. Likewise, cycling grew by an impressive 600 percent in Toronto when a cycling network was completed. Perhaps the biggest misconception about cycleways is that they are just for people who ride bikes. The benefits are much broader, however you choose to get around. Drivers and people on buses face less congestion. Parents can ditch the school run. Parking is easier. Pedestrians don’t have to compete for space on paths. Local businesses have more customers. A British study of 250,000 people called cycling a miracle pill for its benefits in reducing heart disease, cancer and diabetes. Everyone wins when people are healthier and our air is cleaner. That’s why successive Governments have invested in cycling. Life is better when more people ride bikes, more often. Regarding the Island Bay cycleway, there’s never been a project subject to such extensive community engagement. Everyone who wants to has had a say. The important thing is that valid concerns are addressed and we get on with it. In Island Bay that means building kerbs to make parking easier, extending buffer zones to reduce risk from parked vehicles, and continuing the cycleway through the shopping area. The road surface would benefit from a reseal to erase ghost markings. The temporary construction period will result in a street we can all be proud of. Much of Miramar, Strathmore, Rongotai and Kilbirnie are flat: perfect terrain for easy cycling. It makes sense to build high-quality cycleways to connect these suburbs. This reduces our reliance on cars, expands the reach of public transport, and enables people of all ages and abilities to get around. Hills or wind? Not a problem, thanks to gears, muscle and e-bikes. Rain? Wear a coat. Groceries? Use a bag and carrier. No bike? Borrow or rent one. Sooner or later the sceptics will run out of excuses, and embrace cycling. With cycleway construction now underway on Cobham Drive, along Hutt Road and much more to come, I predict the future is bike. Patrick Morgan is a project manager at Cycling Action Network. How well do Advance Stop Boxes work? 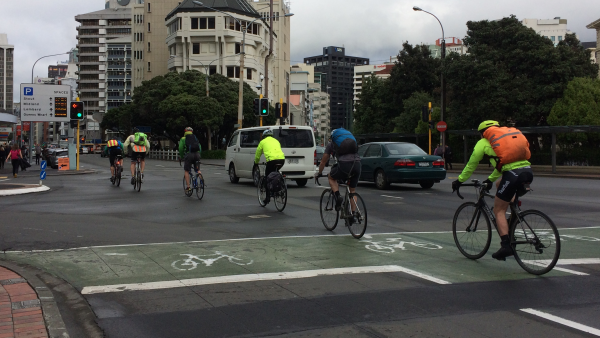 An observational cycling experiment in Wellington. An Advance Stop Box (ASB) at the intersection of Dixon (one-way) and Victoria Streets in Wellington – blocked by motorists in both lanes. It turns out my safety is at least partially compromised by motorists at a majority of stops involving advance stop boxes (ASBs) when riding my bicycle. There are some ASBs at intersections throughout central Wellington. When I say ‘some’, I mean I joked once that I wondered if we had the highest number of ASBs per capita in the world, there are so many. Maybe there aren’t actually all that great a number in reality, but when there is so few other forms of bicycle facility provided in a city, it’s hard to not notice them. Very few Wellington ASBs have any form of bike lane to feed people riding bikes to them safely for instance. The dominance of ASBs throughout Wellington’s central business district (CBD) are only recently challenged for bicycle ‘paintfrastructure’ supremacy by the addition of numerous sharrows – another example of bicycle facility that means well, and wants to be seen to be achieving, but really isn’t. I wanted to know how often things were good, challenging, or impossible. I commute by bike. Every day. Every type of weather. I cycle roughly 6km into the CBD from Island Bay (Island Bay Cycleway RULZ! ), through Berhampore, Newtown, around The Basin, Kent and Cambridge, and through the city to Boulcott Street. There are plenty of times I stop at an intersection and have some difficulty with the ASB being blocked in some way. In my experience I am lucky if I don’t have some difficulty with several ASBs on a journey. So I decided to start counting what went wrong and what went right. I wanted to know how often things were good, challenging, or impossible. I wanted to be able to show that, while there are some positive sides to ASBs, they are under-performing – usually because of consistent infringement by some motorists. This is probably no surprise to anybody, but I hope it helps to understand more about just how bad it is as a cyclist out there and if there are any patterns to these infringements. If there is anything that can be done to improve safety that would be great. This article does not provide any suggestions about how we might go about that. 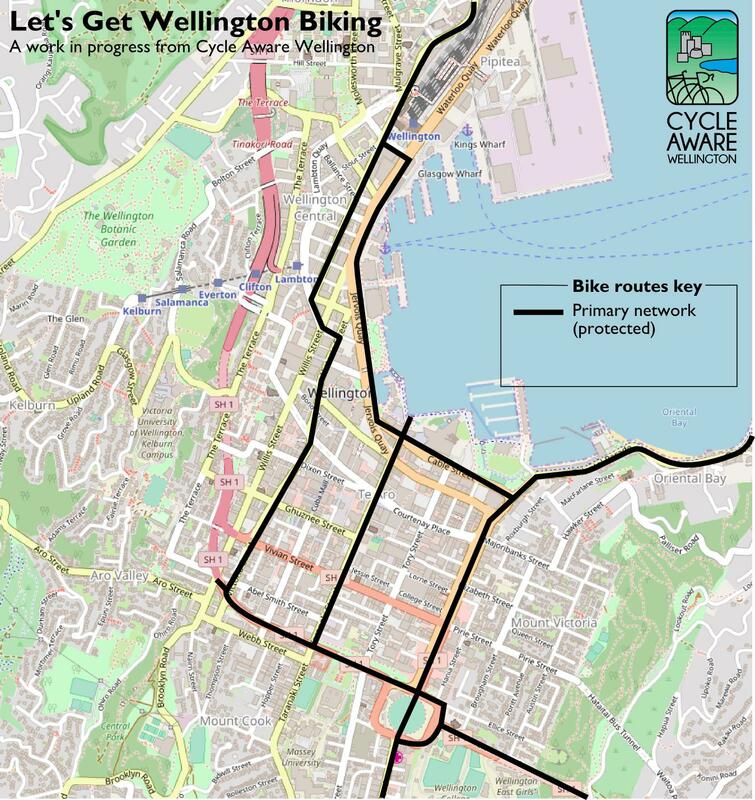 For more about how Wellington cyclists view the effectiveness of our impressive ASB density check out this great post by Alastair. The experiment I ran is just me, my rides, routes, and riding ability. I tried to use a little scientific method to gather observational data to provide a little insight into how effective, or not, ASBs are. It would be interesting to source data from more riders, at different times of day, different bike types, and more routes than I take. Obviously more data would enable more reliable conclusions to be made. I recorded observations on my bike journeys (mostly commuting) over 26 days during March and April 2017. Along each journey I evaluated the conditions at each intersection or pedestrian crossing I stopped at. I did not include any times I stopped on fully separated areas like footpaths, shared paths, or cycleways etc. No obstruction by any motorists. I made evaluations of ASB used on 56 journeys over two calendar months – March and April this year. 46 times I was completely blocked, an average of 0.82 per journey. Or in other words: I experience an ASB as completely inaccessible, on average, once every 4 out of 5 journeys. When not including stops where there was no ASB marked, over half (55%) of evaluated ASB stops were partially or fully blocked by motorists. There are fewer intersections with ASBs outside of the Wellington CBD but it is still worthwhile to show as having nothing is generally worse than anything when it comes to space for cycling. So showing the proportion of stops with no ASB shows that even with the overdose in the CBD, there are large parts of Wellington without even this low hanging fruit. Let’s have a look at the breakdown of the stops of morning vs the evening rides. I’m going to exclude the no ASB numbers to better focus on how stops with them were performing. ASBs were completely blocked by motorists nearly twice as often on my evening journeys. This could be the result of the particular design of the ASBs used by the routes I take, or the mental state of motorists in the morning vs the evening, or the degraded marking of many of them (they’re not being maintained to an acceptable standard in general). Who knows?! Whatever the cause, it is bound to be a combination of factors. Curiously, the increase in fully blocked ASBs seems to be at a roughly even expense of both good and partially blocked stops. It is interesting that partial blocks has not shown a similar rise like fully blocked. I interpret (at least part of) this as a greater proportion of motorists completely disregarding ASBs in the evening, whereas a majority are keeping to their usual habits – whether good or inconsiderate. What do you think it might be? ASB on Dixon Street at the intersection with Willis Street. In a pretty poor state. Not surprising some motorists will ignore infrastructure that is not maintained. Encouragingly, there are new ASBs being installed in Newtown which is welcome. I intend to run this experiment again around the same time next year to see if the data changes. I think it is fair to say that there is some habitual abuse by some drivers consistently ignoring or encroachment on the ASBs. I have also observed a growing number of drivers distracted by digital devices. This problem is especially problematic at city intersections as these are the most dangerous places on our roads and demand a driver’s undivided attention. I did not gather any data on distraction. Maybe that will warrant separate experiment. Regardless of the cause, I think the higher rate of infraction by motorists in the evening is of great concern as it points to potentially greater dangers to vulnerable road users at that time. If my observations through this limited experiment on one form of bicycle paintfrastructure are suggesting this, I wonder what other heightened dangers cyclists and pedestrians face from generally reduced compliance of motorists on our roads at various times of the day? I also wonder how often enforcement of encroaching on ASBs by the New Zealand Police is encouraging Wellington motorists to adhere to the law. Apparently you may be fined $60 for encroaching into the cycling paintfrastructure. Who knew? Is this what you’d like to see on Evans Bay Parade? WCC is consulting on a raft of proposed cycle routes in the eastern suburbs. There’s not much time left to give feedback about these. If you’re reading this, the chances are you’re pretty comfortable about biking. But the proposed routes are not about you: they’re about attracting new cyclists who may be intimidated by a stream of cars and buses behind them as they pedal up Crawford Road to get from Kilbirnie to Newtown, for example. If the new routes get people doing more trips by bike, we reduce congestion and carbon emissions, and improve our health, benefiting everyone. There are 25 different routes proposed, each with a couple of options for implementing them, arrived at by community consultation. While this seems a lot to sift through, there are clear images of the different options, and it’s easy to give online feedback. If you’re time challenged, just give feedback on the routes that are important to you. I’m not going to tell you which options to choose (though in general option A will be a reasonable outcome), but here’s some things to think about as you give feedback. Will the option encourage more trips by bike? There’s no point in implementing the route otherwise. Is it an 8-80 route – in other words, will people from 8 years old to 80 years old be comfortable biking the route? Obviously some proposals (for example Crawford Rd) may not pass this test, but will still be worth doing because overall more people will be encouraged to bike. Protected bike lanes are more likely to encourage new users than bike lanes next to traffic, or sharrows. However on “quiet routes” such as Wilson St in Newtown, and Yule St in Kilbirnie, a high level of protection may not be necessary. In general, one way cycle lanes on each side of the road are preferable since bikes will always be travelling on the correct side of the road. However in some cases, such as Evans Bay, a two way cycle lane on one side of the road will work because the cycle lane crosses few entrances or intersections. Where a bike lane runs by parked cars, is there an adequate buffer zone so people can alight from a car without intruding on the cycle lane? Hint: 0.3m (the length of a shoe) is not enough. Are the driving lane widths safe? In general driving lanes should be about 3m, or over 4m. Lanes 3-4m wide tempt drivers to speed and overtake bikes even though there’s not enough space to do so safely. Could the route be improved by blocking or discouraging through motor traffic? This might be a possibility for Wilson St for example. This could also benefit residents bothered by rat-running commuters. Parking is naturally a concern. However the important thing is that people can find a place to park when they need it. Even if the number of car parks decreases, tools such as time limits, residents parking zones, etc can ensure that parks will always be available to those who need them. It’s preferable that pedestrians aren’t disadvantaged by narrower footpaths. Will the growing numbers of people using eBikes affect the uptake of the route? For example the Crawford Rd route is a bit steep but is a breeze on an eBike. So have a look at the proposed routes, and give your feedback. Now is a good time, but definitely by 17 September (2 October for Miramar Avenue (Shelly Bay Road to Tauhinu Road). All going well, this time next year we’ll have a bunch of new people biking in the east!